Joint Aid Plus™ is a significant remedy that helps repair damage to and provides everyday preventative maintenance for the joints! Anyone who suffers from pain in your knees, hands, elbows, shoulders,wrists, fingers, ankles, back or hips will benefit from taking Joint Aid Plus™ because it actually repairs damaged cartilage, bones and joints! What is Joint Aid Plus? How Joint Aid Plus works? This is as important a medical development as penicillin. There are no known side effects. Tens of thousands of customers have taken millions of pills and we have had no reports of any side negative side effects. 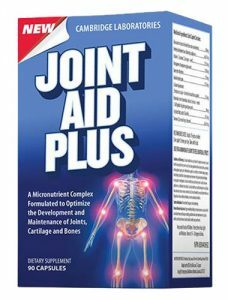 Is Joint Aid Plus™ Guaranteed to work for me? We would love to say it is absolutely guaranteed to work 100% of the time, but of course we cannot. Our scientific studies show that just one of the ingredients in our formula reduces joint pain and stiffness for 88.2% of the people that use it. Considering we have a total of 10 different pain reducing ingredients, we are very sure that anyone who suffers from joint pain and uses Joint Aid Plus™ will experience a noticeable reduction in joint discomfort. We have thousands of customers who swear by the benefits that Joint Aid Plus™ has given them and we suggest you try it by taking advantage of our no risk offer. Who Can Benefit from Joint Aid Plus™? If you suffer from stiff or achy joints, knees, shoulders, hips, fingers, hands, elbows, wrists, ankles or back, you will enjoy the pain reducing benefits of Joint Aid Plus™. In fact anyone who wants to end joint discomfort and enjoy life again can benefit from using Joint Aid Plus™. Order your Joint Aid Plus now!